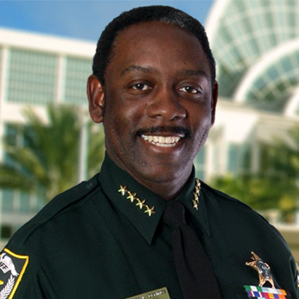 Sheriff Jerry L. Demings has more than 30 years experience in law enforcement. He has served as the Chief of Police for the City of Orlando and Director of Public Safety of Orange County. He was elected as Sheriff of Orange County on November 4, 2008. Under the leadership of Sheriff Demings, Orange County has experienced a reduction in the crime rate for the past 7 years. He has focused the agency on maintaining fiscal responsibility while providing the highest quality law enforcement service. Sheriff Demings is a native of Orlando. He is a graduate of Jones High School and received a Bachelor of Science in Finance from Florida State University and a Master of Business Administration from Orlando College. He is also a graduate of the FBI National Academy and FBI National Executive Institute. Ever Thought of a Career in Public Service?